I can't honestly claim my children were overjoyed to hear that we were off to look at bees and flowers under a microscope. A rolling of eyes and two martyred sighs would perhaps be a more accurate description. But Mum had the bit between her teeth so they grudgingly climbed into the car and off we set for Carymoor Environmental Centre. Steve Mynard of Microscopical Worlds greeted us when we arrived. He works with schools, environment centres, libraries and museums to introduce children aged seven to eleven to the amazing world of the very small. Amazing is the right word. 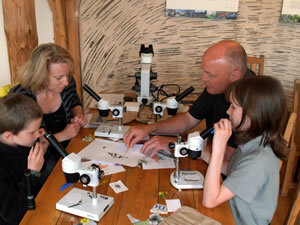 My two quickly became fascinated, all pretence at boredom disappearing as we dived right into the exciting stuff: learning how to focus our microscopes took just a few minutes and then we had a quick turn about Carymoor's wildflower garden to gather up some samples for closer examination under the microscope. We were just a small group so luckily we each had our own set of tools and a microscope to use. Steve showed us how to dissect our flower samples and look at various parts of the flower in incredible detail under the lens. The children were soon inspired and got busy with their own flower samples, stopping only now and then to marvel at something new being shown off by each other. Steve took us to see Carymoor's honey bees, a busy hive with a viewing window where he could point out the deposited pollen and honey within the cells. The children looked hard for the queen bee but she was hiding deep inside and eluded even their sharp eyes. Back indoors, we got back down to more microscopical fun, this time with bees under the lens. I was relieved to learn they were dead (from natural causes, have no fear) as I'm not what you might call brave with flying, stinging insects in the normal scheme of things. Did you know that honey bees have five eyes? Two are on the side of their head but there are another three, called "simple" eyes, in a triangle on top of their head? We saw some exciting and beautiful images of the bees under our lenses, together with their legs, wings and furry bodies, all in incredible detail. Steve's announcement that we were going to get a better look at the bees by dissecting various parts of them was met by my children with the kind of enthusiasm usually reserved for Christmas morning. They eagerly followed directions and were soon becoming acquainted with the finer workings of a honey bee's anatomy. My daughter got slightly carried away, exhorting me to look at a bee's innards which she'd enthusiastically (if perhaps not quite scientifically!) spread on the slide under her microscope. 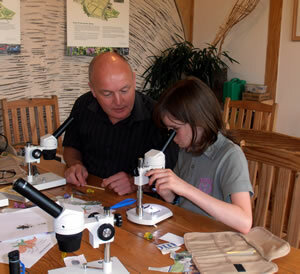 Our time with Steve and Microscopical Worlds was nearly at an end but fortunately there are two other sessions similar to this taking place at Carymoor over the summer holidays and I've booked places already! Wincanton Window wrote about them recently here, but you can also get details from Carymoor's website – spaces are still available and I'd thoroughly recommend you call to reserve your place. As a way of exciting young people's minds and stimulating them to learn new things in a really fun way, this can't be topped. 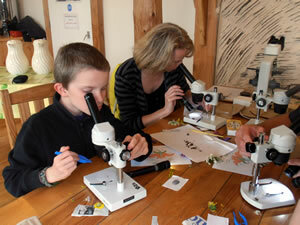 More details about Steve Mynard and Microscopoical World can be found at his website.